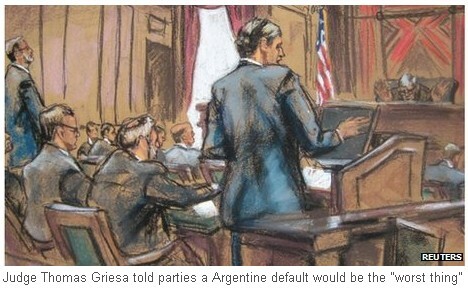 A US judge has ordered Argentina and its creditors to meet "continuously" to avoid the nation defaulting on its debts. District Judge Thomas Griesa told the parties to meet from 10:00 EST (14:00 GMT) on Wednesday to hammer out a deal. Argentina has been in a legal dispute with investors holding debt from the nation's default in 2001-2002. It has until 30 July to find a solution or possibly default again. Argentina has been reluctant to pay the investors describing them as "vulture funds". It also fears that a settlement would prompt claims from other investors, who felt short-changed by the original debt restructuring. Judge Griesa said that further delays to the case were not necessary and that a settlement is achievable. "If we don't, there will be a default, and that is the worst thing. That is about the worst thing I can envision. I don't want that to happen. People will be hurt by that, real hurt. Not vultures being hurt, but real people," he said. The US court is in a powerful position because it can block US banks from paying the vast majority of bondholders who accepted the original restructuring. Judge Griesa told the two sides to meet a lawyer appointed to oversee the talks on Wednesday and meet "continuously until a settlement is reached". The lawyer representing Argentina, Jonathan Blackman, said a settlement "simply can't be done by the end of this month", even with non-stop talks.